HTC is still in a downhill slide, posting negative growth numbers quarter after quarter. Today, the company has released its consolidated results for the first quarter of the year and everything is down compared to the same quarter last year. The only positive development is that the company's expenses are lower, too. Things are looking unchanged compared to the unaudited results we saw lest month. 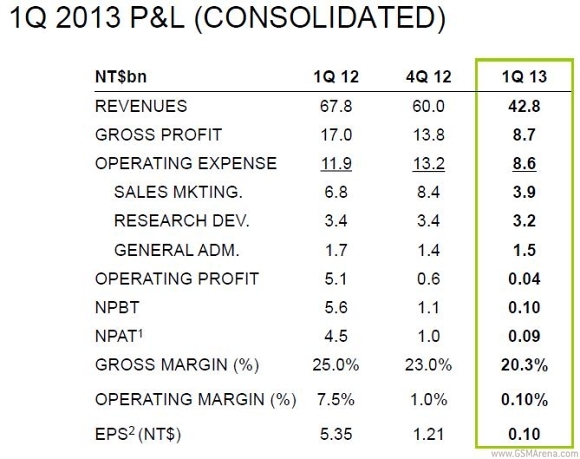 Revenue is 42.8 billion NT$ (USD1.4 billion) while net income was a lowly 85 million NT$ (USD2.8 million). The gross margin in Q1 2013 was 20.3% compared to the 25% of last year's Q1, while operating margin has hit a new low at 0.1% compared to 7.5% a year ago. Positively, HTC has shrunk its operating expense from $4 billion to $2.9 billion and for the next quarter it's projecting a revenue of 70 billion NT$ ($2.3 billion) and a higher gross margin between 22% and 24%.